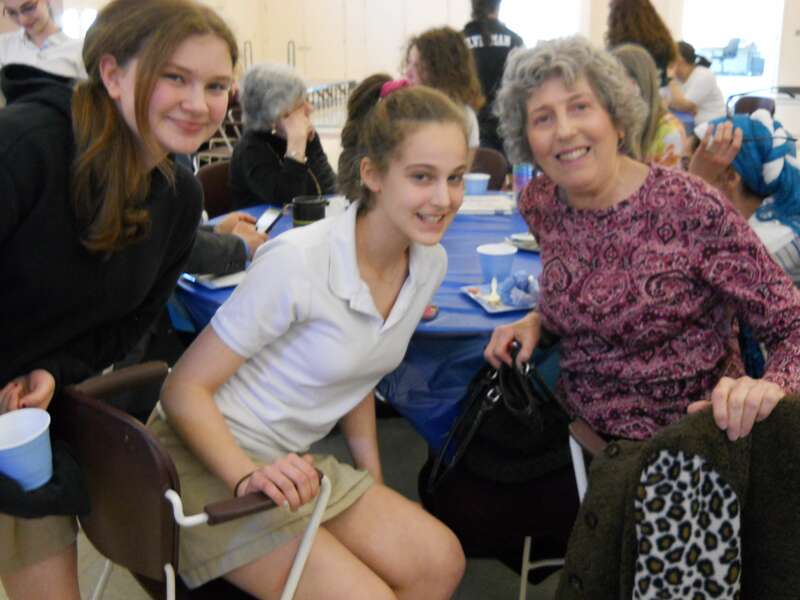 On April 20th , 7th grade students from Krieger Schechter Day School (KSDS) and senior citizens from the Edward A. Myerberg Center (Myerberg Center) presented oral histories to families and peers as they concluded an eight-month collaborative project. The culminating project is part of an intergenerational program that started in September when 7th graders were introduced to the seniors and placed into small groups that met monthly. During the visits, seniors shared their personal histories with the students while the students educated the seniors about technology and digital media. The groups worked together to document the seniors’ life stories, using photos and videos, and create a digital legacy that can be shared with families and future generations. The project was funded and supported by the Better Together Program as part of a two-year initiative that aims to encourage meaningful intergenerational relationships through rewarding, shared experiences. The goal is to teach students to honor our elders while giving seniors a heightened feeling of connection. KSDS and the Myerberg Center were selected to participate in the Better Together program based on an extensive grant proposal that ensured the KSDS Judaics Curriculum would enhance this program. KSDS is part of a cohort of 20 other schools in the country participating the Better Together initiative. Thanks to Middle School Judaic Studies teacher, Ellen Friedman, for preparing our students for this important project. The Better Together program will continue through the 2018-19 academic year with a new group of students and seniors.